For the Toronto Argonauts, being the oldest professional sports team in Toronto means that they have a unique responsibility to do their part in creating a safe culture and climate in the city they call home. It was out of this desire to give back to the community that the Huddle Up Bullying Prevention Program was developed. 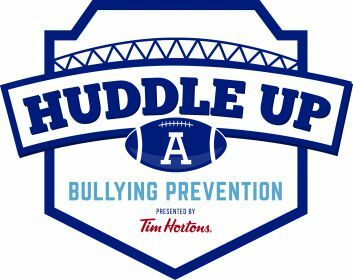 Celebrating its 17th year in September, the Huddle Up Program seeks to utilize student empowerment combined with powerful testimonials to encourage youth to be advocates of bullying prevention in their school. Their goal is to empower kids by giving them a voice, which is the real strength of the program. Huddle Up has visited over 500,000 students aged 8-18 in Toronto and the Greater Toronto Area (GTA). The Huddle Up Program uses a multicomponent approach. They begin with organizing a committee in the school made up of students who have been identified as those who might have experienced bullying, those who might be bullying others and students who are considered to be “popular”. Huddle Up meets with the student committee and gives them guidance as to the content of the assembly they will run in the early spring. From there is it up to the students to create programming for their schools prior to Huddle Up coming back: they create posters, announcements and other outreach tools focused around messaging specific to their school. Through this process, the students are able to play the key role in identifying bullying in their school and educating their peers about bullying and school climate. The next step is the assembly which takes place between January and May at the school. The assembly involves a Huddle Up staff member, an Argonauts cheerleader and an Argonauts player who share testimony about their experiences with bullying and overcoming challenges in their lives. The student committee also does a short presentation. Then the students watch a video of the Argonauts and recite a pledge to promote a positive school climate, which the school then posts. The Huddle Up Program has evolved since its inception in 2001. As research on bullying and relationships has changed, so has the program’s messaging. They have shifted their focus away from teaching students why they shouldn’t bully to empowering youth to build a positive school climate and character traits. Next year the program will introduce a second phase, which involves the school getting a kit to replicate the program in their second year of participation, so they can run it independent of the Huddle Up staff. This approach will allow them to provide programming for more schools. The Huddle Up Program celebrates its successes through positive feedback from participants, schools and parents. They frequently receive letters from students who experienced bullying in their schools, often asking how they can pay forward what the program has done for them. This past year, after a Huddle Up assembly, a student approached one of the Argonauts players and expressed an immediate need for help. All participants in the program are trained, so the player was able to quickly communicate the student’s needs to school administration who were then able to get the student the care they needed. These are just some of the success stories this program has had over the years. Working with PREVNet has been very beneficial for the Huddle Up Program. The partnership has allowed dialogue regarding any questions they’ve had around messaging and instruction based on the latest research and evidence-based practices. Additionally, PREVNet’s Dr. Debra Pepler has also participated in training Argonauts player ambassadors before they go into schools. Huddle Up representatives also attend the PREVNet conference to learn more about how they can make their program more effective based on new research. With this kind of partnership, Huddle Up can continue to improve their program and empower youth in Toronto to make a difference in their schools.